A famous image from Dr. Albert Mason’s paper in the British Medical Journal (August 23, 1952). 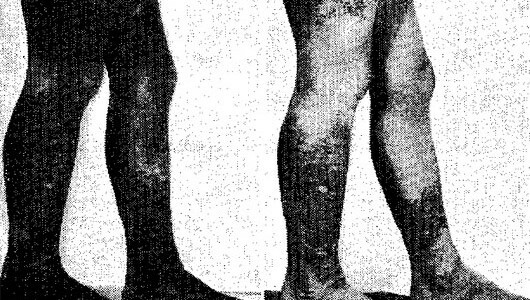 The picture on the left shows legs with icthyosiform skin before treatment; the one on the right shows the same legs after treatment. During his recent trip to London, Dr. Albert Mason talked to Marcia Holmes about his career in medical hypnosis and psychoanalysis. We are grateful to him for generously providing these valuable reminiscences about his illustrious career in the field. In 1951, Dr. Albert Mason was a young anesthesiologist at Queen Victoria Hospital in East Grinstead, who in his practice often used hypnotism to treat pain and cure common ailments. A chance occurrence led to a medical and professional breakthrough: by hypnotizing a young boy whom he believed was covered in hard, black warts, Dr. Mason brought relief – and clear skin – to the child. Yet, as Mason very quickly discovered, the boy did not suffer from warts but congenital icthyosiform erithrodermia of Brocq, a condition that, by all medical accounts, should not have responded to hypnotism. This amazing success was documented in the British Medical Journal and immediately lifted Dr. Mason’s career, bringing him hundreds of patients and worldwide fame. Faced with a daunting array of patients whose ailments resisted other medical treatments, Dr. Mason became increasingly wary of the limitations of hypnotism as a therapy. More troubling than the patients he could not cure were the ones who believed that his hypnotism had cured their condition, when in reality they still suffered obvious symptoms. Mason expressed some of these doubts, while extolling the possibilities of hypnosis, in his 1960 textbook, Hypnotism for Medical and Dental Practitioners. In the early 1960s, after pursuing neurological experiments with Martin Halliday, Mason came to believe that hypnotic anesthesia did not attenuate pain signals to the brain, as some scientists had suggested, but rather diminished a subject’s conscious awareness of these signals. He became convinced that many of the patients he treated were suffering from psychosomatic conditions and required intensive psychotherapeutic treatment to alleviate their physical discomfort. He trained as a psychoanalyst at the Institute of Psychoanalysis in London. By 1969, Mason had left his career in hypnosis. He moved to Los Angeles with the influential psychoanalytic writer and practitioner, Wilfrid Bion, helping to bring the Kleinian model of psychoanalysis to the United States. 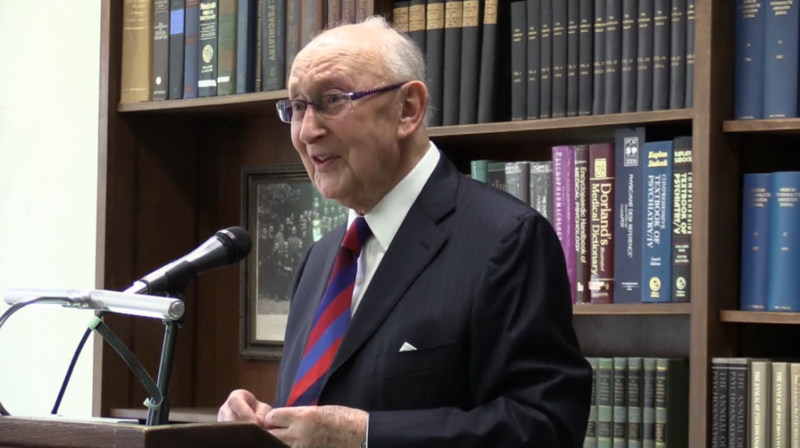 Dr. Albert Mason, speaking at the Psychoanalytic Center of California in 2016. In 1994, Mason reflected on his early career in medical hypnosis in Psychoanalytic Quarterly, considering what had initially led him to pursue hypnosis as a medical therapy, and how his experiences with hypnosis had led him to become a psychoanalyst. He argues that successful hypnotism is a folie à deux in which both the hypnotist and hypnotic subject believe in the near-magical abilities of hypnotism to cure physical problems or modify behavior. This shared belief—which Mason aligns with Klein’s ‘projective identification’—can bring about a desired alteration in a patient, but this change may be merely superficial if it does not address the real source of the patient’s suffering. AA Mason, Hypnotism for Medical and Dental Practitioners (London: Secker & Warburg, 1960). AA Mason, “A psychoanalyst looks at a hypnotist: Folie à deux” Psychoanalytic Quarterly (1994). AA Mason and AM Halliday, “The effects of hypnotic anesthesia on cortical responses” Journal of Neurology, Neurosurgery and Psychiatry 27 (1964): 300-312. In the two excerpts that follow, Dr. Mason talks about how his early successes using hypnotism made him famous, yet led him to question the nature of hypnotism’s therapeutic effects. He also explains how his celebrity led to extraordinary personal experiences, including serving as scientific consultant during the filming of The Ipcress File (dir. Sidney J. Furie, 1965) and pursuing ESP research with Arthur Koestler, the author of Darkness at Noon. Audio clips edited by Marcia Holmes; transcript prepared by Annie Blumenberg. 00:00 This is Marcia Holmes interviewing Dr. Albert Mason, in London, on the 11th of July, 2016. 00:16 MH: Dr. Mason, will you start by telling us where you grew up? 00:20 AM: I was born in Newark, New Jersey, USA. And my mother became homesick and was told to go back to England where she had emigrated with my father. So she moved back to England. I was a year and a half. And then grew up in England after that. We moved to Stepney. I grew up in Stepney, I went to school there, and got a scholarship to Guy’s Hospital, did my medical training in Guy’s Hospital, graduated in ‘49, then did a period of anaesthesia. I thought I’d become an anaesthetist. And during that period of training I experimented with the use of hypnotism for the delivery of babies. And delivered about 20 babies by using hypnosis as the only anaesthetic, feeling that that wouldn’t anesthetize the baby. And that was very successful. And I got another job in another hospital, Queen Victoria Hospital, East Grinstead, with Sir Archibald McIndoe. The plastic surgery hospital. And whenever people hear that you do hypnosis they send you all sorts of cases that don’t respond in any other way. So they sent me different cases and one of the things that I knew I could treat was warts. I had treated several cases of warts, I’d treated an English rugby player, who was covered all over in warts. Hundreds of them. And they all went. 02:39 AM: So one day I was about to about to give an anaesthetic to a young boy of 15 and I looked at his arm and it was, I thought, covered in millions and millions of warts. You couldn’t put a pin in between them. Black warts. So I managed to get a needle through, anesthetize him, wheeled him into the theatre, and the surgeon, Mr. Moore, a well-known plastic surgeon, I said to him “Why don’t you treat this case by hypnosis?” And he looked at me and said “Well why don’t you?” and walked out of the theatre. I learned later that he took one look at the boy and felt it was hopeless and wasn’t going to do surgery in any case. He was going to graft skin from the chest onto the hands. He’d tried once and it failed. So this was an attempt to retry. Anyway! 03:46 AM: So I took the boy away, and he woke up, and I said “Mr. Moore has turned you over to me, and I’m going to treat you with hypnotism.” So he said okay, and I hypnotized him and told him the warts would fall off his right arm, leaving the skin underneath soft and normal. Sent him away and asked him to come back in a week. Came back in a week, and his arm was clear. So I wasn’t tremendously surprised, because I’d cured warts before. Took him back to see Mr. Moore, who was operating at the time, and I held out both arms through the glass of the operating theatre. Moore looked at it, put his knife down, came out and looked at these two arms and I said to him “Well I told you warts go by hypnosis.” He said “This isn’t warts; this is congenital ichthyosiform erythrodermia of Brocq. Go and look it up! It’s congenital!” So I went and looked it up and then I started to shiver, because he’d been born with it, it was incurable. There was no sebaceous glands, no elastic tissue in the skin. Fortunately, I had done only one arm. Photographed it, otherwise nobody would’ve believed it. So then I treated the rest of him with a 70% success rate, published it in the British Medical Journal – sent it to the British Medical Journal, and forgot about it. About a year later the phone rang 7 o’clock in the morning and I picked it up and a voice said “Is that Dr. Mason?” And I said “Yes.” “This is Whipsnade Zoo; we have an elephant with skin like a little boy. Can you treat him?” I thought ‘What the hell are you talking about?’ I put the phone down and then it started to ring. What had happened, was the case had come out in the medical journal. And every newspaper in the world, including TIME Magazine, had picked this case up and phone calls came from all over the world of people with incurable conditions wanting me to hypnotize them. So I opened a little clinic and started to treat, and then realized that I didn’t know what I was doing and decided that I would have to try and find out. And I was offered a research scholarship at St. George’s Hospital, London. So I left my anaesthesia job, went there, and treated a series of skin conditions which was published in the International Dermatological Society, and I was offered another scholarship at West London Hospital, and at King’s College Hospital, and I treated a series of asthma. And published all these cases of various research projects through hypnosis. 07:27 AM: I suppose Harry Saltzman must have heard about this and contacted me and asked me whether I would consult with him about a movie he was making called The Ipcress File. And that’s how it came about. Quite by accident. 07:48 MH: So, going back to your early start in hypnosis; most people think of, when they think of hypnosis they think about the stage shows. But medical hypnosis is somewhat different. Can you described the process you used in those early days, and how you learned to do it? 08:09 AM: You know, it’s no different, only it’s used differently as a stage show, or in various diseases. But the process is the same. You take a person and usually you tell them to lie down and then you speak to them in a soft soothing voice, telling them to relax, they’re going to get sleepy, they’re going to get heavy, their eyes are going to close. And they’re going to go into a deep sleep where they’ll hear your voice and they’ll do whatever you ask them to do. Exactly the same process. They do that on the stage, but they also generally hypnotize them and then say “In the future, when you hear the words ‘Spanish Armada’, or when you hear me tap three times with my pencil, you’ll go into a deep trance immediately. You’ll go into a state of hypnosis.” That’s called a post hypnotic suggestion. So then they become hypnotizable just by saying this phrase, or by whatever signal you’ve given them. And stage hypnotists do it, and medical hypnotists do it in the same way. How did I learn it? I got a book called Medical Hypnosis by Walberg. And I read how you do it, and I started to follow the reading and that’s how I learned. That’s how it happened. 09:52 MH: But when you had your initial success, it seems that you wanted to do follow up research. What were your goals, or interests in hypnosis? 10:58 MH: At the time, in the 1950s and 60s, there were other scientists and psychotherapists interested in hypnosis, including the limitations, as you say. Did you feel like you were part of a community? 11:14 AM: Yes, I joined the Society of Clinical and Experimental Hypnosis and became a Fellow, and started to, and of course read extensively, and started to teach medical and dental practitioners how to do hypnosis. And what were the phenomena that you could do with hypnotism. Which I had learned from the book and which I had tried on volunteers, and found I could do. It was as simple as that. 11:59 MH: What was the process in writing your 1960 book [Hypnotism for Medical and Dental Practitioners]? 12:06 AM: Well it was a book like any other textbook of medicine. It was a book that taught you about how to induce hypnosis, what were the uses of it, what my experience was, and it was published 1960 I think by Secker & Warburg, and had a limited success but my career was then launched. 12:39 MH: And were you treated and considered as a worldwide expert in hypnosis? 12:44 MH: Did that only add to your patient list? 12:48 AM: Yes, well I was interviewed by the British Medical Association, who were doing investigations in hypnosis. I was one of the people they interviewed. I was asked to consult on a play running the West End called The House by the Lake, with Flora Robson, written by Hugh Mills. I was consulted by Noel Coward, and one of his actors had stage fright so I went backstage and hypnotized him and then he went on and did quite well. So I opened a practice of hypnosis and had a job in the West London and I changed to Queen’s College Hospital and stayed there until I became an analyst. 00:02 MH: Was it in this period that Harry Saltzman called you to tell you about The Ipcress File film? 00:09 MH: What do you remember from those conversations? 00:14 AM: Well, he said that we’re producing this movie about somebody who gets captured and brainwashed and there’s a machine that they use which does feedback of the electrical impulses of the brain. It was called the Dawson Averager. Dawson was the name of the man who invented it. He said that it would be nice to see if we could get a use of this machine and have a movie in which we show the machine being used to indoctrinate somebody along a certain line to carry out our commandments. So by this time I had published a paper together with Halliday, a Dr. Halliday. The paper was very interesting paper. We hypnotized nine people and first we put a needle in their finger and we put the Dawson Averager machine on their head. And when you put the needle in you got a blip on the Averager, showing that the—it was a record of the pain impulse traveling from the finger to the cortex of the brain. 02:20 AM: And then we hypnotized them and told them they would feel no pain whatsoever. Again, put the needle in the finger. No blood pressure rise, no pulse elevation, so they were clearly not feeling it. And the blip was unchanged. So we deduced that the theory that had been previously held that hypnosis cancelled out the brain—the pain impulses going to the brain. So the hypnotic suggestion cancelled out and prevented the pain impulses reaching the cortex. And we showed that wasn’t true. That it didn’t cancel them out, they reached the cortex, so obviously what had changed was the perception of the pain. So we published this paper, nine subjects, showing that we had ablated the awareness of pain but the pain impulse was arriving at the cortex unchanged. And we did the same with deafness. We could show the patient, we told them that they would not hear and their hearing almost went, they still could hear faintly. But again the blip was unchanged in amplitude. So it obviously was arriving unchanged but they had unchanged but they had blotted out three quarters of the sensation of hearing. 04:07 AM: So we showed that even though under hypnosis maintained they couldn’t feel pain; the pain was arriving unchanged at the cortex. So the hypnosis altered perception but it didn’t alter any neurophysiology. 04:27 MH: That sounds like a very exciting result, especially in that time when there’s so much scientific research, especially in Britain, about sensation, perception, consciousness. Were lots of people using the Dawson Averager at the time in their research? 05:01 MH: What did it look like? 05:20 MH: With the paper read-out and the oscilloscope? 05:23 AM: Yes, that’s right. That was the machine. 05:28 MH: So were you there for filming? 05:32 MH: What did you see? Did you see the whole scene being filmed with Michael Caine, and? 05:39 AM: Yes. Well first of all I spoke to Michael Caine and he said “How shall I act?” So I said “Well, um you’re in a state of something like a hypnotic trance and so you just lie still but maybe you may feel a bit trapped and claustrophobic. So, although you’re tied down – I think he was tied, strapped down – you can show signs of trying to escape in some way but that’s about all.” And so Michael Caine did his best to show some signs of trying to escape. 00:00 MH: Were you following the conversation about brainwashing at the time? 00:08 MH: Did it seem fanciful, or sort of just fictional to you? Or? 00:12 AM: Well, I mean, um, look, brainwashing is not a mystery. We’re brainwashed all the time by religious beliefs, by advertisements. We’re having suggestions put into us which become part of us. Now there are some techniques, obviously, which can be more powerful than others and obviously if you hypnotize somebody and you make suggestions to them in a hypnotic state over and over again these suggestions will become more effective than the suggestions we have every day. In fact, I did some very interesting experiments. I was contacted by a writer called Arthur Koestler. You know Koestler wrote Darkness at Noon. And he said “Dr Mason, I’ve read about your paper,” everybody had read about this paper because it was published in every newspaper in the world. 01:29 AM: He said “And do you think that two people in a deep hypnotic state can transfer thoughts between each other?” So I said “Well I don’t know.” So he said “Would you like to do some experiments with me on that. I was a PhD, I was a psychologist in Hungary.” Which turned out to be a lie. Um, but, uh, so I said “Sure.” So one Saturday morning he came around and I had two deep trance hypnotic subjects, that I had hypnotized and conditioned. And sat one on one side of the room, one on the other side of the room, and we gave one Rhine cards. You know, you turn over one card and there’s a circle or a square or a triangle or wavy lines. There are four patterns. Turn it over, think about it, and the other person writes down what they think you’re thinking. So we did a run of 100 or so of these two hypnotic subjects in a hypnotic state, one of them turning over the cards, looking at them, thinking. And the other one writing down what she thought they saw. Did 100. Just coincidence, there was no correlation. 03:12 AM: So we broke, and we went and had some coffee or something, came and we started again. And after about, I don’t know 20 minutes, half an hour, the one started to get hits, which could not be accounted for by coincidence. So we got very excited by this, you see, and then we stopped, we went and had lunch and I said to Koestler, “You know, if they’re transmitting thoughts from one to the other surely if we put a screen in between them they’ll be able to transfer thoughts through the screen.” So he said “Yes, that makes sense.” So we got back again, got the two girls, hypnotized them, did another series with a screen in between. It went back to just coincidence. So we deduced that one girl could tell what the other one was looking at by expression or movement or something, how do you look like a triangle? How do you look like a square? God knows! But people can transmit things sometimes by expression, and somehow in this trance state they managed to transmit while looking at each other thoughts, but they were not transmitting thoughts they were transmitting something. 05:00 AM: Because when we put the screen, it didn’t work anymore. So that was another experiment I did in the hypnotic state. 00:00 But clearly hypnosis can, I believe it is, a state of suggestion itself. See I wrote, um, a paper called ‘Folie à deux’ in which I showed that one person could affect another person, one person can affect another person and really drive them insane, by having insane thoughts and living with someone the other person can become insane by picking up the insanity of the first one. It’s a well-known condition called folie à deux. And I thought that hypnosis is a really a folie à deux, it’s a state where one person can transmit to another a fantasy, a delusional state, and they catch it, so to speak. And I think that’s what happened with my original ichthiotic case. I think he had a wish for something magical to cure him, he was so crippled. And I had a belief I could do something magical. Because I was young, I was 27, I cured warts and of course I needed something magical for my career. 01:37 AM: And I think somehow that combination of two people wanting so much to produce something could actually change physical things. Psychosomatic illness is that. Freud himself had a folie à deux with a man called Fliess, an ear, nose and throat surgeon. Freud sent his patients to Fliess to have their noses cauterized because he believed Fliess’s idea that you could cause all sorts of diseases by a nasal reflex and Freud believed this for a period, you see, until he got disillusioned. But so folie à deux is a condition and I think that’s what hypnosis is, it’s a folie à deux. 02:55 AM: You’ve read it? 02:56 MH: Yes. You’ve reflected at that stage on your earlier career in hypnosis. 03:02 AM: You read the paper ‘A Psychoanalyst Looks at a Hypnotist’? 03:06 AM: Really?! Did you like it? 03:32 AM: No. Certain things happened that, which made me very worried about the use of hypnosis. For instance, I treated a series of asthmatics, which I published. And we would get them to recall how many wheezes they’d had in between treatments, to see what effect a hypnotic suggestion had on them. I was given a research grant by the Asthma Research Council of Great Britain to do this. And I remember one person coming to me, and I said “Well, how have you been since I hypnotized you last week?” “Wonderful, doctor. I haven’t had wheezes at all.” I could hear him wheezing across the room. So that worried me. How much was I altering perception, producing a delusional state, and not actually affecting things? The other thing that worried me: I was walking across Hammersmith Bridge one day and a woman came up to me and said, “Do you remember me, Dr. Mason?” I said no, I’m sorry. “I am the wife of man that you treated with a skin rash on his feet, on his legs.” I said oh, I remember him, how is he? She said, “Oh his skin rash is gone, but he is a changed person. He has become terribly irritable now.” So I suddenly realized I had transformed an irritation of the skin to an irritation of the person, that the man was irritated. And one form was to scratch, and another form was to scratch his wife. So I realized I was converting things, not curing. And that made me want to understand about the mind, and what it can do. And so I became a psychoanalyst. 05:45 MH: So when you started training to become a psychoanalyst did you think you were going to be leaving hypnosis behind? Or, just adding to your practice? 05:57 AM: At first I thought I would be adding, but it soon became clear to me, I began to understand conversion symptoms and how people even if they’re not hypnotized, you could treat them with medicine, think you’ve cured them, and what had happened is you’ve pushed the symptom around the body. I had a job at King’s College Hospital, and they would bring in a stack of papers—patients came because they had a skin disease. And I’d look at the first paper and I would see ‘Migraine Department, cured by so and so’, and then the next one, ‘Rheumatic Department’, and then the next one ‘Irritable Bowel Syndrome’. They’d all cured them! And yet they kept coming back with different things. What hadn’t been cured was a psychological state of some kind of anxiety or depression, and all that had happened was you got rid of one symptom and it converted to another. So that’s what made me turn into an analyst where you end up trying to treat the patient, and their psychological disorder, and not their skin or some other symptom. 07:31 MH: Would you say that this earlier career in medicine and these awful skin diseases has really shaped you as a psychoanalyst? Given you a different perspective than perhaps one might expect of a psychoanalyst? 07:51 AM: Well it certainly shaped me to now think about illness in a different way. I think most decent psychoanalysts would think similarly that the problem with a person is some unconscious anxiety that needs to be addressed, and if you treat the bowel without treating the person, you are not really respecting human beings having ‘mind’, but I think psychoanalysts do respect the human mind, and how the mind can cause things like depression, anxiety – psychological symptoms—but also physical symptoms. Skin rash, asthma, ulcer, hypochondriasis. 08:54 MH: I want to go back and ask you more about being an expert in hypnosis, because your intellectual biography shows, that I think you’ve always been very curious and concerned about hypnosis and what it is and what it is not and what it can do and what it cannot do. But at the same time you were having amazing results and you were publishing interesting articles, which gained you a lot of positive interest from the public, from other professionals, but it must’ve also, I mean did it make you a sort of lightning rod of criticism? Did you ever had, were you ever put on the spot to defend what you were doing? 09:41 AM: Well that’s why I wrote that paper, ‘A Psychoanalyst Looks at a Hypnotist’. I tried to examine why I’d taken up hypnosis and why I’d given it up. I thought it were that human beings need to be understood as human beings and not as itchy skin, or a case of diarrhoea. That there was organic disease but there was also organic manifestations of psychological illness. So of course it shaped me, and I think that most psychoanalysts would understand that without having gone through the period of hypnosis. 10:42 AM: Well Freud did. Freud was a hypnotist to begin with. And then he gave it up when he suddenly realized that the patients he was hypnotizing got very attached to him even erotically, and he started to investigate this attachment, called transference, called the relationship between. And I published a letter in the British Medical Journal where I said that I realized that one of the cases that we treated, the better results were because there was a deeper relationship between the patient and myself. That there was something about the relationship which affects illness. People are always looking for messiahs and magic and uh, hypnosis seemed so much like magic. And the interesting thing is some cases you treat by hypnosis get well and remain well. And seemed to be well all round. But others don’t, others convert, and others you fail it. 12:07 AM: I once treated a series of 50 smokers, chronic smokers who couldn’t give up smoking. And I hypnotized them to give up smoking. About 25 of them failed to give it up. Of the 25 who did give it up about 20 put on a lot of weight. And then I was left with 5. There was one depression, and one skin rash, and in the end, there was I think only 2 who could be said to have given it up and benefited without something else replacing it. 13:00 AM: I once had a man came from Johannesburg to see me. And I opened my front door and he went like this. [Mason puckers his lips]. So I backed right up, said come in, he was a doctor. 13:14 MH: He went to kiss you? 13:15 AM: Yeah, well, it looked like that. And I said to him “what’s your problem?” he said “That! I’ve got no practice left. My patients all have left me.” So I took his history, and when did it start? And he said it started when he’d given up smoking. So I said “It seems to me that the symptom is a longing for a smoke.” He said “Really? I’m going to go and buy a packet of cigarettes immediately.” And he rushed off, bought a pack, and it went completely. So there was a symptom like a tic, but it was connected to his longing over cigarettes, so you know, the human mind is uh. So I was not content with treating symptoms. I ended up by treating human beings, which is what I’ve done the rest of my life. 14:21 MH: Do you find any more intellectual interest in hypnosis, or do you feel that you answered your questions? 14:27 AM: Well, I think I’ve answered a lot of questions about it. I would like to know why the few people who get well and remain well do that. And I wonder if it’s because of some, you know conversion that they’ve been looking for, it’s what Bion called a messianic wish. For someone to come along and fulfil some of their fantasies. I had a tremendous case of trigeminal neuralgia. A very serious illness, that they end up by injecting the ganglia with alcohol and cutting it. This case I hypnotized her, told her the pain in her face would go, tears ran down her face and she said it’s gone. And I followed her up for many, many years and it always remained gone. So there are one or two cases like that, which are mysterious. Most of them are psychological conditions that don’t get well with hypnosis, they need something more.